The Library of Congress has taken civil rights activist Rosa Parks’ archive of letters, writings, personal notes and photographs and made the entire collection available online. According to the Associated Press, the collection of 10,000 items belonging to Parks was made available to the public Wednesday, and we have philanthropist Howard Buffett to thank. That’s because Buffett ended a legal battle between Parks’ heirs and friends in 2014 by purchasing the entire collection and then placing it in the national library’s hands as a long-term loan. Parks is remembered for refusing to give up her bus seat to a white man in Montgomery, Ala., in 1955. The move sparked a yearlong bus boycott that led to the end of segregation. The collection paints another side of Parks’ protest. According to AP, Parks and her husband both lost their jobs because of her activism and at one point were poor. It would take Parks almost 10 years after the 1955 boycott, when she was hired by the district office of Michigan Rep. John Conyers, to earn what would then have been considered a living wage. The library now holds about 7,500 manuscript items and 2,500 photographs from Parks, who died in 2005 at the age of 92. Other items include a Bible she kept in her pocket and her Presidential Medal of Freedom, AP reports. 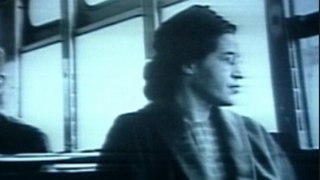 View the Rosa Parks archive here.